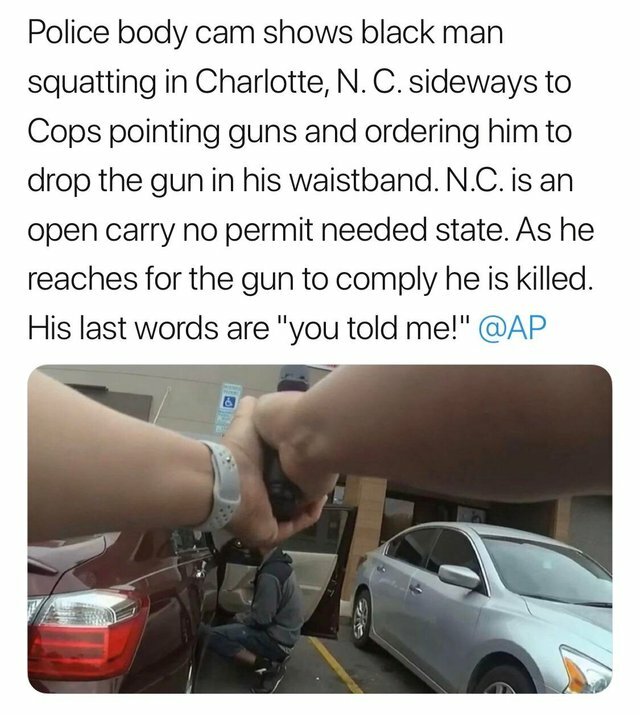 Controversial police shooting of licensed carry. They were shouting orders to him to put the gun down for a good 40 seconds before he appeared to comply. Those officers had to be thinking, "WTF is going through this guy's head right now to not obey? Is he working up the courage to shoot?" Why was he squatting behind defensive cover of the car and open door if he wasn't considering shooting at them? Shame. Even if he was able to react in what I would consider a normal way ( he appeared to be impaired, by either drugs or maybe I have to bring race into it. Don't know) BUT, even if he had complied, he still would have been shot by virtue of reaching for the gun to put it down. This is true.